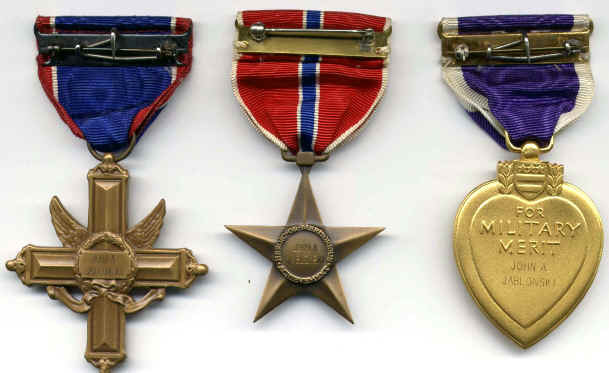 Examples of officially named U.S. Decorations of the Vietnam War era. A few notes on commonly asked questions. 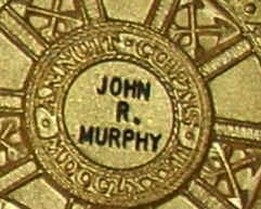 Are all U.S. medals named? Why or why not? 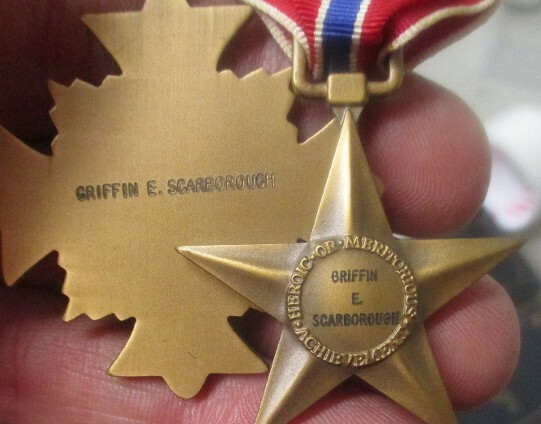 No, the majority of awarded American decorations are not named to the recipient. Generally speaking awards are named when they are mailed to the recipient or his family or on occasion when they are awarded in a specific ceremony. 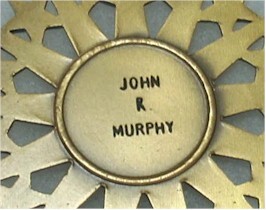 Lastly the recipient may return his awards to the government for naming. 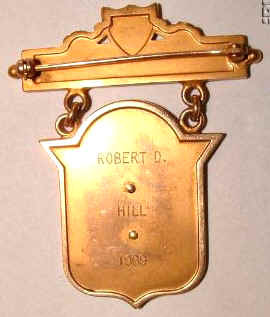 Any medal named by order of a U.S. Government issuing agency can be considered officially named. Most often that is done through the Phil. QM. Medals named by order of an area commander can also be considered officially named though for authentication purposes they should come with accompanying documentation. 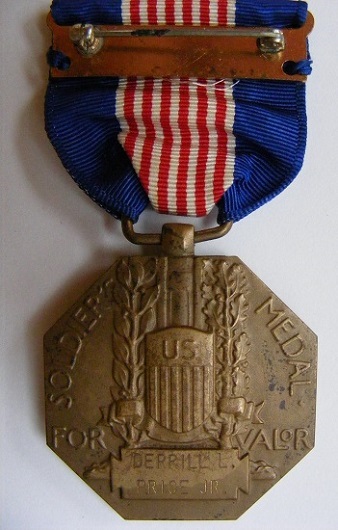 Many examples can be found of medals named in the CBI theater during WWII and in Japan during the Occupation and the Korean War that were officially named and presented however not done by an issuing agency such as the Philadelphia Quartermaster Depot. 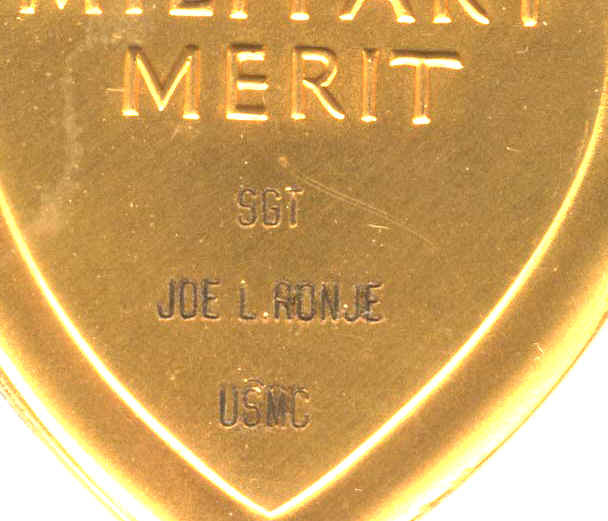 Typical Marine naming for posthumous awards of the VN period is small capital letter impressed naming with rank/name/USMC in 3-4 lines. 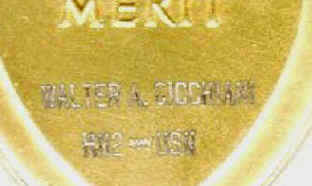 There was a note in one of Al Gleims auctions that stated he believed the Marines ceased naming awards after Tet due to the large number of casualties. 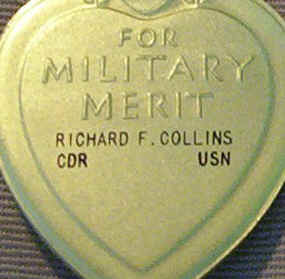 This has since become 'gospel' to medal collectors, in my opinion though this may be true for a temporary period of time, but it is true for more than an undetermined short period of time and I have encountered officially named awards for Vietnam service from the post-Tet period. 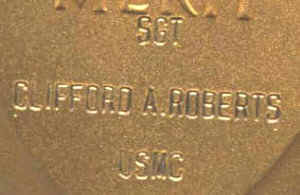 Shown below: Clifford A. Roberts, USMC KIA 7/9/65. 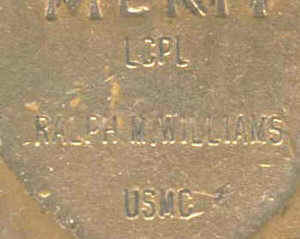 Using remaining stocks of medals, Roberts PH is a Type II WWII full wrap broach medal and came in the short Type II case of issue. 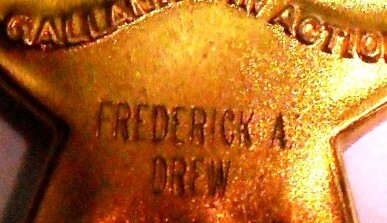 only on close inspection and the letters are never hand engraved or unevenly struck. There are observed hearts with the naming set very low to the center and other's with the naming perfectly centered. 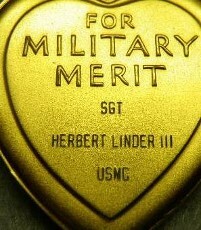 A Marine Corps posthumous Bronze Star / Purple Heart pair. 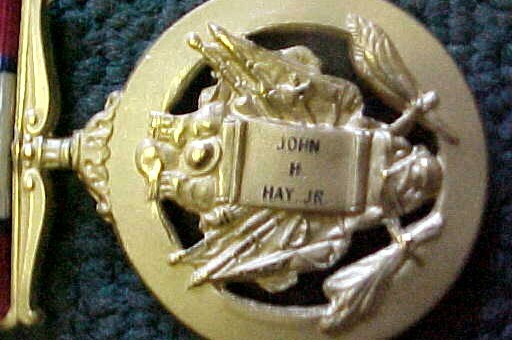 Posthumous named Silver Star medal to a US Navy Hospital Corpsman who served with M company 3rd Bn 4th Marines and was Killed in 1968 . This is a WWII contract US Navy Silver Star with a Wrap Brooch and thick planchet . It is properly machine engraved " Earl R./ Burnley. Jr / HN USN " . HN Burnley was KIA May 16, 1968 at Quang Tri Province. Courtesy O'Shea. The following three are courtesy of Adam Rohloff. 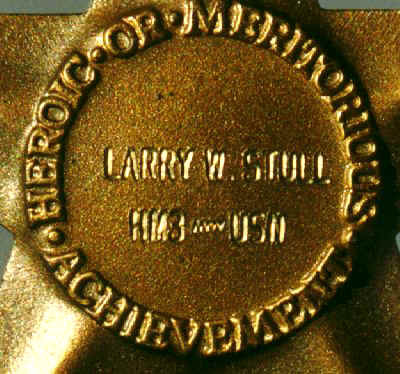 This USN Bronze Star to Stull is posthumous. 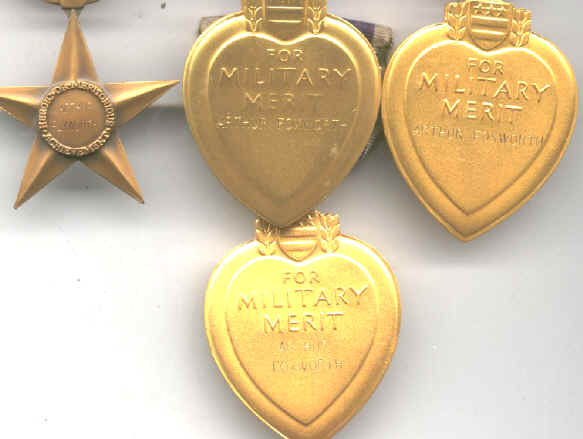 The Commendation Medal and Purple Heart to Siow are posthumous. Interestingly the PH is a Navy type I, with silver gilt planchet and split wrap brooch. Siow was an enlisted man in Observation Squadron 67, flying spy missions in Laos. He was lost when his P-3 Orion went down in January of 1968. * Note the 'squiggle' between the rate & USN on the medals above & below. 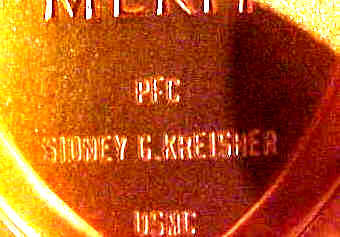 Air Medal to Rauscher is a non-posthumous award, so apparently official engraving wasn't restricted to just KIA decorations. 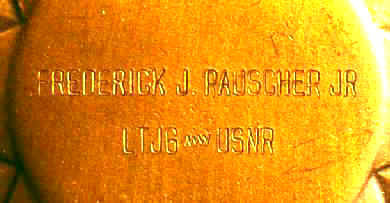 Rauscher was a radar intercept officer in VF-14, flying off the USS Franklin D. Roosevelt, awarded the AM in 1966. Lt. Commander Richard F. Collins went MIA November 22nd 1969 flying an A6A Intruder in a mission off the USS Ranger. Below is shown Lt. 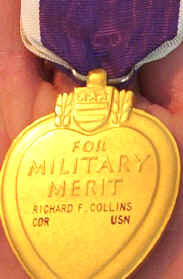 Commander Collins' Purple Heart as awarded to his family in 1978 upon the Navy's finding of death changing his status from MIA to KIA. 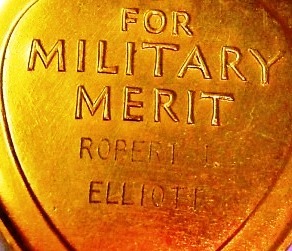 Not the naming is in a different style than the 1960's awards and that it reflects his MIA rate increase to Commander. 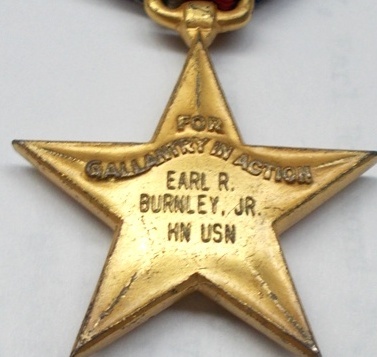 This Air Force Silver Star was awarded to Airman Shubbuck posthumously for an action on Jan. 16, 1966. 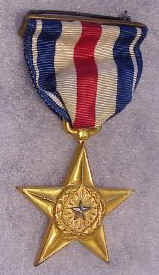 Officially named in a style commonly found on awards such as Silver Stars, Bronze Stars, and Army Good Conducts with a smaller surface area for naming. USAF naming styles from the Vietnam War have perhaps the most inconsistency. But this small font is often seen. This trio is named to Lt. Richard VanDegeer, an Air Force pilot killed in 1975 in the Mayaguez Incident. The group trio is unquestionably correct as it was sent to his family and include the original documents. 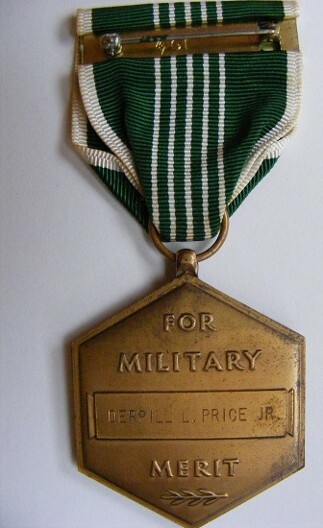 It includes possibly the only known posthumous award of the Joint Service Commendation medal. The naming is very atypical of what would be found and shown for example I would normally say stay away from naming like this unless you know the source and it comes with original documents as this group does. USAF naming can often be in patterns that would be unofficial by other branches standards. This is an officially named USAF Air Medal. Col. Marian A. Tierney served in Vietnam 1966-67 as Chief of U.S. Army Nurse Corps. She earned her Soldier's Medal in a plane crash near An Khe in '66. 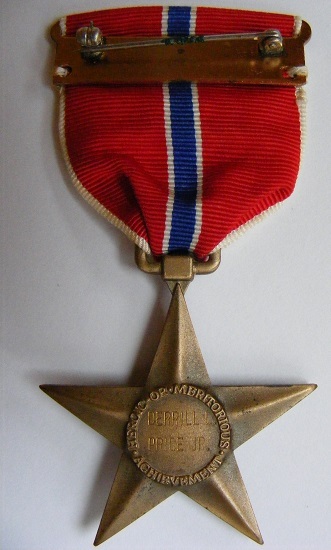 The SM would have most likely been issued to her in 1967 and the Legion of Merit at a different time. SSgt. 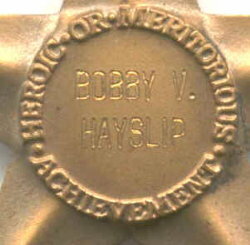 Bobby V. Hayslip KIA 5/19/67 1st Cavalry Division. A slightly different than usual naming style. 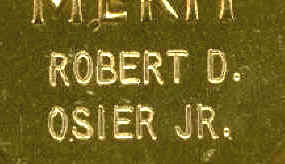 Roger L. Henson, KIA Dec. 1967 with the 25th Division. 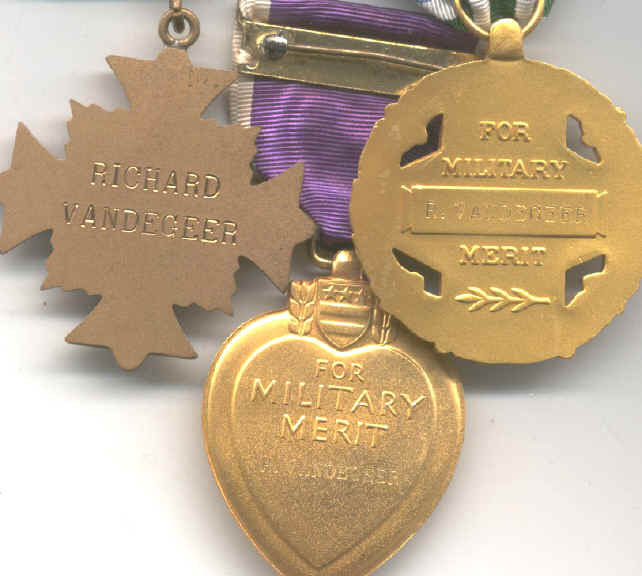 Medals issued to family in Feb. 1968. The letters are .08 - .09 mm tall as is correct. Deeper & heavier naming than usually encountered. 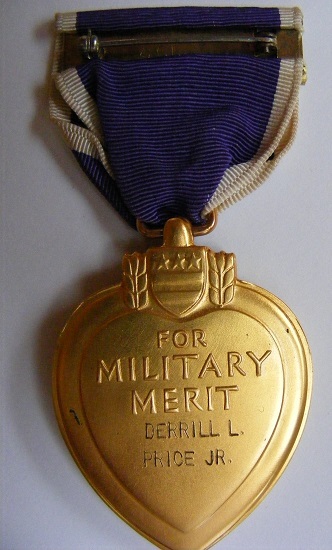 The Army Gold Distinguished Marksman Medal below is officially named as presented in 1969. Courtesy Ebay. For extraordinary heroism in action on August 8, 1968, while serving as team leader during a reconnaissance0in-force mission near Can Giuoc. HQ US ARMY Vietnam General Order number 5752. (Dec. 17, 1968). neatly mounted in frames. I have found nothing printed by the military concerning this practice however this group to Richard Knight is solid proof. 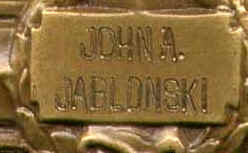 account of the medals being presented to his Mother in August of 1971. General Hayes' DSM for Vietnam as 1st Div. Cmdr.